Is the future something you embrace or fear? Do you have a plan for your dream career? UTS:Careers and the UTS Alumni team are pleased to present ‘How to Plan for Your Dream Career ' on Wednesday 7 June. Featuring an expert panel of guest speakers, don’t miss this chance to meet your peers and learn practical tips to be successful in your career path, as part of our Alumni Professional Development series, designed exclusively for our newest UTS alumni. Whether you have just started your professional career or you are looking for something new, this event is for you! Hear from a diverse panel of industry experts and a former UTS graduate offering candid insights on how to plan beyond university for a successful professional life. Enjoy learning how to create a career exploration plan that includes self-assessment, industry exploration, tools, campus resources and a personalised job search timeline with your fellow UTS graduates who have also just completed their studies! Co-Founder of The Outperformer, a career management platform, and author of CFgrOw, Staying in the driver’s seat on the path to CFO, Brad will be exploring career planning with a focus on setting yourself up for future employability now. In this session, Brad will share a strategy and techniques to help you start career planning now, a unique perspective on putting yourself in the driving seat when approaching career management specifically how to navigate your journey & realise your career goals. Valeska, founder of One Shot, which works with job seekers to achieve their next role, will utilise her extensive recruitment background to elaborate on Brad’s strategy with practical applications you can start using now. Camille, founder of Monday Mind, will present on her journey from successful chartered accountant to entrepreneur. Since graduating from UTS, Camille has worked as a mining accountant, an academic, a yoga teacher and as an entrepreneur. Camille will share practical tips on how to get your first job and then how to move from the corporate world to the entrepreneur space. 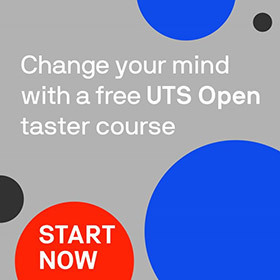 Best of all, it's free for UTS alumni! This free event is part of a range of exclusive career services for recent UTS alumni – whether you’re a recent graduate just starting out in the job market, or more established in your career, find out how UTS:Careers can help you.